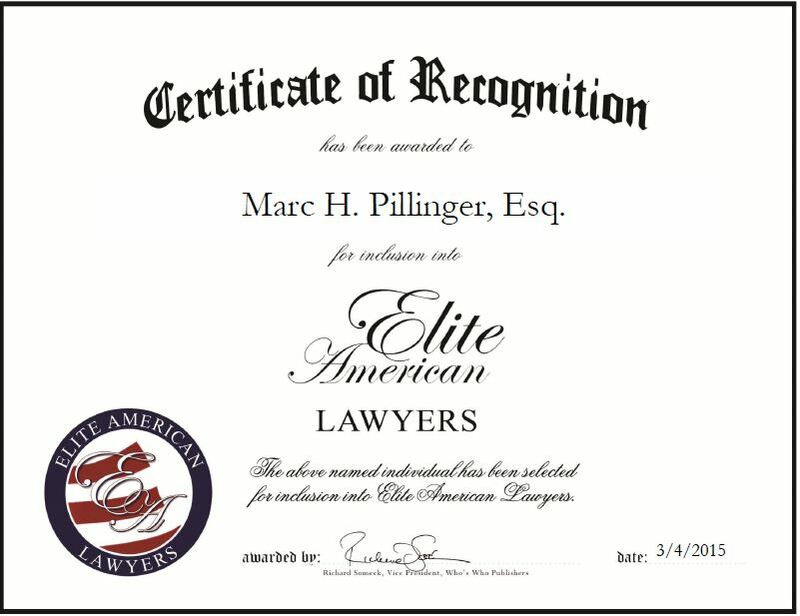 Elmsford, NY, March 4, 2015, Marc H. Pillinger, Esq., Attorney at Law and Senior Partner at Pillinger Miller Tarallo, LLP, has been recognized by Elite American Lawyers for dedication, achievement and leadership in litigation. Mr. Pillinger has nearly 40 years of experience in the legal profession and has garnered a reputation for his knowledge of construction and labor law, and environmental and toxic torts. He is admitted to practice in New York in both federal and state courts, and utilizes his experience to drive the success of his firm, Pillinger Miller Tarallo, LLP. In his role, Mr. Pillinger is responsible for overseeing the litigation department, and being counsel to many of the insurance company clients and third-party administrators. Throughout his career, Mr. Pillinger has worked on various multi-party litigation cases, and was the lead litigator for high-profile environmental cases. He takes great pride in his ability to get his clients their desired results. He makes sure to work closely with his clients and build strong relationships with them in order to develop the most comprehensive legal strategies. He has received ample recognition for his work and is listed in Top Lawyers of Westchester, Super Lawyers and Bar Register of Pre-eminent Lawyers. Aside from his work at the firm, Mr. Pillinger is an active member of the legal community. He is a lecturer for the New York State Bar Association and the Insurance Society of Philadelphia. He is also a member of RIMS, CLM, NYC Association of Trial Lawyers of America, NYS Trial Lawyers and the National Fire Protection Association. He attributes his success to the consistent growth of his firm throughout the years and the level of clients they serve. This entry was posted in Litigation and tagged construction, environmental law, federal and state courts, insurance, labor law, toxic torts. Bookmark the permalink.